Brexit will be delayed, quite possibly indefinitely. May’s looking for a way to achieve this while putting the blame on anyone but herself. She survived this votes only becasue of the DUP, whose votes she bought. Welcome to democracy. Theresa May has survived as prime minister after weathering a dramatic no-confidence vote in her government, but was left scrambling to strike a Brexit compromise that could secure the backing of parliament. In a statement in Downing Street on Wednesday night, the prime minister exhorted politicians from all parties to “put aside self-interest”, and promised to consult with MPs with “the widest possible range of views” in the coming days. It followed her announcement that she would invite Jeremy Corbyn and other party leaders for immediate talks on how to secure a Brexit deal, something she had declined to do earlier in the day, although Labour later said Corbyn would decline the invitation unless no-deal was taken off the table. The Scottish National party’s leader in Westminster, Ian Blackford, met May on Wednesday night, and the Liberal Democrat leader, Vince Cable, also accepted her invitation. Blackford later wrote to May, urging her to make a “gesture of faith” to show that she was serious. He said the SNP would take part in cross-party talks if she was able to confirm “that the extension of article 50, a ruling out of a no-deal Brexit and the option of a second EU referendum would form the basis of those discussions”. Corbyn is gambling on new elections. That, too, delays any solution. Jeremy Corbyn has said he will not hold talks with Theresa May until the prime minister agrees to remove the threat of a no-deal Brexit, ruling out any meeting with the prime minister in the immediate aftermath of the no-confidence vote. Responding to May’s offer of swift talks to break the Brexit impasse, the Labour leader told MPs that before he would entertain “positive discussions about the way forward” she had to agree to his precondition. “The government must remove clearly once and for all the catastrophe of a no-deal exit from the European Union and all the chaos that would result from that,” Corbyn said minutes after the opposition party was defeated in the confidence vote. Investors expect a delay to Britain’s exit from the EU following the crushing defeat of the prime minister’s Brexit deal, the Bank of England governor has said. Mark Carney said the reaction of financial markets in the wake of the vote showed a degree of confidence that a no-deal Brexit was unlikely on 29 March. The pound bounced back against the dollar on Tuesday night amid optimism that article 50 would be prolonged and that the prospect of a disorderly severance from Brussels had receded. “Public market commentary, consistent with our market intelligence, is that a rebound appears to reflect some expectation that the process of resolution would be extended and that the prospect of no-deal may have been diminished,” said Carney. Speaking to MPs on the Treasury select committee on Wednesday, the governor said investors were following developments in parliament closely to detect shifts in the direction of Brexit. The reaction of EU officials and governments across the continent was also being watched closely. Carney said a “sharp rebound in sterling following the vote” was the main indicator that some investors believed Brexit could be delayed beyond the end of March. 2nd referendum is poison. General elections not so much. But the Tories will cling to power no matter what. More than 170 business leaders, including Terence Conran and Norman Foster, have thrown their weight behind the campaign for a second referendum on Brexit. In a step designed to indicate growing support for a “people’s vote” after Theresa May suffered the heaviest parliamentary defeat in the modern era over her Brexit plan, the letter due to be published in the Times on Thursday asks both main party leaders in Westminster to support a second referendum. Conran, the renowned designer, who was knighted in 1983, and Lord Foster, the architect behind the Gherkin skyscraper in the City of London, were among 172 signatories from the world of business urging a second referendum on the final Brexit deal. The architect Sir David Chipperfield and the noble laureate and research scientist Paul Nurse were also among new names on the list of supporters. Several other captains of industry, including Mike Rake, the former chairman of BT, had previously backed the campaign and were also included as signatories. The figures from business, together representing more than £100bn in annual contributions to the UK economy, warned that a bad Brexit deal or Britain leaving without any deal at all could damage the economy. While admitting that many business leaders had initially backed May’s deal, even though they believed it was far from perfect, the group stated that the priority after the prime minister’s defeat in parliament was to stop a “chaotic crash-out from the EU”. The letter said: “The only viable way to do this is by asking the people whether they still want to leave the EU. With the clock now ticking rapidly before we are due to quit, politicians must not waste any more time on fantasies. We urge the leadership of both the main parties to support a people’s vote.” Both May and the Labour frontbench under Jeremy Corbyn have so far dismissed the idea of a second referendum. The prime minister has said she will speak to senior MPs to find a compromise deal, while Corbyn is pushing for a general election. German economy is under severe pressure. Still, I don’t see what’s so wrong about fewer cars. German carmakers on Wednesday warned of fatal consequences if Britain left the European Union without a divorce deal, predicting job losses in Britain and Europe and urging lawmakers to redouble efforts to ensure tariff-free trade can continue. Prime Minister Theresa May’s deal to leave the EU suffered an overwhelming defeat in parliament on Tuesday, leaving the country’s future in limbo and manufacturers bracing for their “worst-case scenario”, a no-deal Brexit. Britain would suffer most if it lost free trade with European markets since 80 percent of vehicles assembled in the country are exported, mostly to the European Union. But for Germany the stakes are also high. Cars is not the big one, agriculture is. But Europe won’t budge on chlorinated chickens. He said they may have been an “effective tool” in getting China, Canada, Mexico and others to negotiate on trade. Iowa senator Grassley also wants the EU to agree to include agricultural issues in trade talks, although EU trade commissioner Cecilia Malmström said last week the 28-country bloc could not negotiate on agriculture. The White House has pledged not to move forward with imposing tariffs on the EU or Japan as long as it is making constructive progress in bilateral trade talks. Trump has urged the EU to drop its 10% tariff on imported vehicles. The U.S. passenger car tariff is 2.5%, while it imposes 25% tariffs on pickup trucks. Trump has repeatedly threatened to impose new auto tariffs. “Cars is the big one,” Trump said last year. The economy grows 6% amid widespread job losses?! Beijing is working hard to stop a slowing Chinese economy from hitting its workforce. In the last several weeks authorities have made a flurry of announcements, including tax cuts, monetary policy loosening and plans to support public spending. The push comes as economic data points to sagging domestic growth and the U.S. looks set to keep up the pressure on trade. Amid that environment, worries of widespread job losses won’t help the already gloomy sentiment that’s giving consumers a second thought on spending. The overarching worry for China’s leaders is that unemployment could lead to social unrest, and deeper questioning of the Communist Party’s claim to having a handle on the best interests of the country. Already, the economy is widely expected to slow from around 6.5% growth to just above 6%. “We think the biggest risk in the near term is rising unemployment around the Lunar New Year,” Haibin Zhu, chief China economist and head of China equity strategy, J.P. Morgan, said in a Monday report. [..] Gavekal Dragonomics’ China Consumer Analyst Ernan Cui pointed out in a Jan. 9 report that an official survey covering 374,000 large industrial firms shows total employment declined by about 2.8 million people in the 12 months through November. [..] [A UBS] survey in November found that 23% of 125 Chinese respondents in manufacturing have already laid off employees due to the negative effect of U.S.-China trade tensions. Some 34% planned to lay off employees in the next six months, and 18% had cut wages, the report said. Job losses in Chinese manufacturing accelerated in mid-2018 after the U.S. imposed tariffs Note: Employment in large industrial enterprises, three-month moving average. December excluded for data anomalies. Following what Bloomberg calculated was a record net reverse repo liquidity injection on Wednesday, when the PBOC injected a whopping 560 billion yuan of liquidity into the financial system via open market operations, the Chinese central bank has done it again and in Thursday’s open market operation, it sold 250BN yuan in 7 Day repos (slightly below yesterday’s record 350BN), and 150BN in 28 Day repos, which net of maturities resulted in a whopping net 380BN yuan ($56.2BN) liquidity injection. This brings the net liquidity injection this week to a near record 1.14 Trillion yuan (Monday 20BN, Tuesday 180BN, Wednesday 560BN and Thursday 380BN) and the week is not even over yet – should tomorrow’s reverse repo be of similar magnitude, then this week will go down in history as China’s biggest liquidity injection on record. As yesterday, today’s massive liquidity injection was aimed at “keeping reasonable and sufficient liquidity in banking system as liquidity falls relatively fast during peak season for tax payments,” according to a statement from the PBOC, although why this year should be such a significant outlier, even when factoring in the liquidity needs ahead of the Lunar new year, to prior periods was not exactly clear. There is, of course, a much simpler explanation: with Chinese economic and trade data turning from bad to worse with every passing day, Beijing’s response is increasingly one of a panicked “spasm”, as Nomura’s Charlie McElligott wrote today when he noted that with regard to the response of Chinese authorities in addressing their economic slowdown and credit crunch, “it had to get worse before it got better”—recently collapsing Chinese data has now clearly forced an escalation of easing-/stimulus-/liquidity- policies. He ‘won’ by one vote. And now has to win another vote on the name deal itself. Funny to see western media all say Macedonia is set to change its name. Who likes homework, after all? There is no country named Macedonia, that’s the whole point. The Greek prime minister, Alexis Tsipras, has won a confidence vote in parliament, clearing a major hurdle for Greece’s approval of an accord to end a dispute over Macedonia’s name and averting the prospect of a snap election. Tsipras called the confidence motion after his rightwing coalition partner Panos Kammenos quit the government on Sunday in protest at the name deal signed between Athens and Skopje last year. Parliament gave Tsipras 151 votes, meeting the threshold he required in the 300-member assembly. His leftist party, Syriza, has 145 seats in parliament. Additional support was given by defectors of Kammenos’s Independent Greeks party (ANEL) and independents. Tsipras told parliament: “I call upon you with hand on heart to give a vote of confidence to the government which gave battle, which bled, but managed to haul the country out of memorandums and surveillance,” referring to Greece’s international lenders, who kept the country on a tight leash for years. [..] Greek opponents of the agreement say Macedonia’s new name – the Republic of North Macedonia, reached after decades of dispute between Athens and Skopje – represents an attempt to appropriate Greek identity. There are far too many questions for this to go away. Bill Barr to the rescue. When the annals of mistakes and abuses in the FBI’s Russia investigation are finally written, Bruce Ohr almost certainly will be the No. 1 witness, according to my sources. The then-No. 4 Department of Justice (DOJ) official briefed both senior FBI and DOJ officials in summer 2016 about Christopher Steele’s Russia dossier, explicitly cautioning that the British intelligence operative’s work was opposition research connected to Hillary Clinton’s campaign and might be biased. Ohr’s briefings, in July and August 2016, included the deputy director of the FBI, a top lawyer for then-Attorney General Loretta Lynch and a Justice official who later would become the top deputy to special counsel Robert Mueller. At the time, Ohr was the associate attorney general. Yet his warnings about political bias were pointedly omitted weeks later from the Foreign Intelligence Surveillance Act (FISA) warrant that the FBI obtained from a federal court, granting it permission to spy on whether the Trump campaign was colluding with Russia to hijack the 2016 presidential election. Ohr’s activities, chronicled in handwritten notes and congressional testimony I gleaned from sources, provide the most damning evidence to date that FBI and DOJ officials may have misled federal judges in October 2016 in their zeal to obtain the warrant targeting Trump adviser Carter Page just weeks before Election Day. They also contradict a key argument that House Democrats have made in their formal intelligence conclusions about the Russia case. Since it was disclosed last year that Steele’s dossier formed a central piece of evidence supporting the FISA warrant, Justice and FBI officials have been vague about exactly when they learned that Steele’s work was paid for by the law firm representing the Clinton campaign and the Democratic National Committee (DNC). A redacted version of the FISA application released last year shows the FBI did not mention any connection to the DNC or Clinton. David guts the entire narrative. Well done. The Donald has been on a red hot twitter rampage, and he’s completely justified. Actually, we didn’t think the Russian Collusion Hoax could get any stupider until we saw the New York Times’ Friday evening bushwhack. The trio of authors, apparently self-tortured victims of the Trump Derangement Syndrome, actually had the gall to print a story in the once and former Gray Lady of journalistic rectitude which was nothing more than an ugly smear on the sitting President of the United States—one that would have done Joe McCarthy proud. [..] the trio —one of whom graduated from Harvard in 2015 and the other two not much older—don’t seem to even know that foreign policy is a debatable issue. Or that the American people actually voted into office a candidate who took the other side of Imperial Washington’s unwarranted demonization of Putin and made no bones about his desire for a rapprochement with Russia. Actually, as to pursuing rapprochement, so did: • JFK, after the near catastrophe of the Cuban Missile Crisis; • Lyndon Johnson, after the Seven Days War during his meeting with Kosygin at Glassboro NJ; • Richard Nixon, with the ABM Treaty, detente and his visit with Brezhnev in Moscow; • Jimmy Carter, when he signed the SALT-II agreement; • Ronald Reagan, when he went to Moscow to virtually end the Cold War; and • Bill Clinton, when he sent a multi-billion IMF aid package to Yeltsin to help him get re-elected in 1996. The fact is, all of the above presidential policy initiatives were heatedly debated in Washington during a period when the US and Soviet Union each had roughly 9,000 nuclear warheads pointed at the other. But that did not lead to FBI counter-intelligence investigations of politicians—to say nothing of sitting Presidents—who took the “wrong” side of these thoroughly democratic debates. Wonder who they’re mocking. Is it Bezos? The paper “reports” that Trump abruptly left his office at 3:15am on May 1, leaving a message on a napkin in the Oval Office that blamed “crooked Hillary,” the mysterious “Hfior,” and “the Fake News Media” for his flight. The report, meticulously mimicking the Washington Post’s source-based reporting style, cites “four White House aides” speaking on condition of anonymity, that they found the napkin two days before events took a dramatic turn. Trump’s fictional resignation and the subsequent swearing-in of Vice President Mike Pence, who instantly promises to keep as low a profile as possible, comes amidst “massive protests” staged by a grassroots movement with #MeToo as its backbone. [..] The news of Trump’s resignation sparks a wave of celebrations across the globe, with European countries refusing to shelter him. The creators of the fake diligently stick to the Washington Post’s style, fanning the Russia collusion narrative just like their prototype by sending Trump to seek safe haven in Russia – namely, Crimea. While there has been speculation that radical liberal political activist group MoveOn or CODEPINK, a women-led grassroots NGO, might be behind the stunt since they promoted the action, later in the day, The Yes Men, a progressive non-profit group, claimed responsibility in a press release. UK MPs want action. I say don’t depend on politicians if you want to get things done. Britain has a target date of 2042 for phasing out avoidable plastic waste. As its volume is set to treble by 2030. That is so insane, forget about the rest too. Politics won’t solve this. A new global agreement to protect the seas should be a priority for the government to stop our seas becoming a “sewer”, according to a cross-party group of MPs. Plastic pollution is set to treble in the next decade, the environmental audit committee warned, while overfishing is denuding vital marine habitats of fish, and climate change is causing harmful warming of the oceans as well as deoxygenation and acidification. The effects of plastic pollution are particularly poorly understood, the committee found in its report, published on Thursday. It found “a lack of data on the serious long-term harm and health implications of plastic particles entering the food chain” and accused the government of treating the oceans as “out of sight, out of mind”. This topic contains 17 replies, has 8 voices, and was last updated by kultsommer 3 months ago. Now that Picasso is something. Secretly Corbyn – never a fan of the EU – is hoping for a no-deal Brexit. The ensuing chaos can be blamed firmly on the Tories, the DUP will withdraw its support so the government will not survive the next vote of confidence. PM Corbyn can then put in place all the measures, such as re-nationalizing the railways, supporting key industries and agriculture etc., which would all be in breach of EU laws. And here I was told we had no leverage and needed to surrender without trying anything. Is it fun and painless? No. When the Boomers burned down the house and have left us freezing in a dung heap, it’s not fun. All answers now are very hard and require work and sacrifice. But their answer to X, Y, and Z was “There’s nothing you can do but die in a hole so shut up about it.” There is always something to be done, the trouble is, we’re still not trying any of it. Example: German cars are the primo example of why you can’t have a green economy. Any green reform that follows the laws of physics is going to radically cut consumption and therefore GDP. Because GDP = Energy use, so cutting energy use = cutting GDP. So where are you going to find a coalition that wants to radically cut GDP? Cutting GDP will also set off a worldwide financial collapse because debt-economies and debt-money require ever-increasing debt leverage at an every-increasing rate. I’m not against cutting energy, consumption, and replacing the entire money-debt system, in fact I am strongly for it. However, no one – and I mean NO ONE – except stalwarts like me are going to actually bite on the medicine like this and save their children. Save them from debt, centralization on par with vicious fascism, from resource depletion, from plant, animal and area extinction, from the violent destruction of childhood, from global warming or other effects of radical, suicidal unnecessary overuse that every day makes our lives a little more miserable. No. They will NOT take up that fight and WILL leave the world a little – or in fact a LOT – worse for their children. So they’re all going to signal and blather on and pretend, and not work, not try, do nothing, party on and murder their children and communities. And so they have, and attack me for telling them the obvious, provable, daily truth of it: that they CAN change, that this IS happening, and they CAN fix it. But nothing for it. Chattering on twitter is much more satisfying than buying less and planting a tree with the savings. So who am I to say? I did my duty to tell them, it is not my duty to violently overrule their free choice the way they are so happy to violently overrun mine. “I prefer peace. But if trouble must come, let it come in my time, so that my children can live in peace.” – Thomas Paine. Would that we had such men today. I can get them through a green GDP contraction without killing 1-2 Billion people, as they so earnestly and publically desire. I have the toolbox. But they will not do it if they have to cancel Netflix and not add that free shipping item on Amazon. They will not do it if they have to eat an apple that is NOT poisoned and won’t cause childhood leukemia, because it’s smaller and slightly less red than they’re used to. I know because I’ve tried and every day I try again. This is not actually going to change, but success is not my duty. Only my actions and intent are my duty. And now I have to get back to work. Corbyn et al want it all in one go, and therefore will never get anything. They would have to have power first. And wanting such things secretly is always a bad choice. Lay it out there. Just not all at once. You’re not f*cking Trotsky. Worst of all is Labour are such poor communicators. Of course it’s ridiculous that Corbyn is labeled an anti-Semite and everyone says he called May a stupid woman when he didn’t, but if you can’t deflect that obvious a set-up you should take a few courses in Politics 101. As things are, Labour is losing support at the very moment May is losing everything else including the whole country. Saw a few seconds of Corbyn in the Commons the past few days, and it could have been shot a year ago, or two. Same old same old. Britain needs its own Ocasio. Same old same old. Britain needs its own Ocasio. Yeah, run on a program that says we’ll have to pay to save the planet, or the system, or whatever, and you’ve already lost. Because there’s always someone who say you don’t need to pay, just vote for me. We’ll go down believing we can make a profit saving the world for our children. Is it any more ironic that the guys who actually make that profit have children too? I’m not even sure. Are we more tragic than we are stupid? A toss up. People really think that politicians will solve their problems, because after all they’re everyone’s problems. These people haven’t been paying attention. Politicians are elected because they’re good at persuasion, not because they’re good at solving problems. It’s exceedingly rare that both qualities are found in one person. And then, why would such a person want to enter politics? That takes a third quality: the desire to tell people what to do, sociopathy. Our economic systems are bad enough, with their eternal growth models. Our political systems are just as destructive. And of course that’s just because we are too. We don’t give a hoot about the truth, we want stories that make us feel good. We just need people who persuade us these stories are true. Never a shortage of those. Here’s the kinder, gentler EU, that won’t have national wars anymore. Why? Because each nation will individually declared war on their citizens. Trigger warning, and for a change, that’s not a joke. In case you haven’t heard yet: while you were looking the other way, or not looking at all (you know who you are! ), Putin Stole Santa’s Home. a no-deal Brexit was unlikely on 29 March. Why would anyone (but Trump) impose tariffs or taxes that destroy import and exports. recently collapsing Chinese data has now clearly forced an escalation of easing-/stimulus-/liquidity- policies. The Chinese politicians are just as smart as the western politicians. They can print. traces its origins to the first punches and dies used to make seals and currency in ancient times, which ties the concept to printing. There’s only one explanation: Trump GAVE Putin the north pole. This is the smoking gun! For entertainment, some people watch the magnetosphere and the solar winds. The disturbing part here is, they’re not solar. Or not according to any data/sunspots being tracked. The magnetic field fluctuates on a 10,000-ish cycle and last flipped 41,000 years ago. It’s weakening 10x faster than usual, and as expected, when it weakens it’s able to wander. This has been associated with Ice Ages, appearing as fast as 20 years, which means it is associated with interglacial warm extremes as well. Why are they associated? It was a long time ago, so they are not certain. However, the declining magnetosphere seems to be associated with increased volcanism somehow, which may precipitate a volcanic winter, leading to a positive feedback loop that tips from long, steady warm into 10,000 years of cooling. That may seem unusual or unlikely, but we can as easily chart minor volcanic winters on a clear time clock such as the one near 535AD, it stands to reason there could be a fractal that gives larger effects on larger timescales. So we have a lot of historical data that suggests global heat/cold is associated with the rhythms of the sun and earth’s magnetosphere, and we are unhappily at one of the earth’s magnetic extremes right now, at a time when indeed seismology and volcanism are increasing rapidly at an increasing pace. 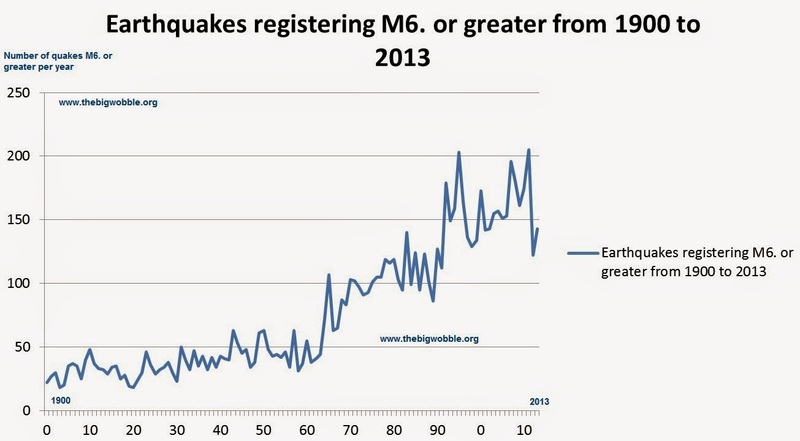 Interesting data side, earthquakes in general have not increased (although that’s hard to tell when seismographs are so young) but large earthquakes have. Why? More research as it would seem counterintuitive to the theory. Anyway, supposing a huge body having an earth’s worth of electrons does have a bit of electric charge and magnetism: that’s why we have a magnetic field in the first place. Now suppose your magnetic metal-shaving- ball loses its magnetism. Does it fall apart? Make sinkholes? Get loose and sloppy? How much? When these huge parts move, wouldn’t they set off volcanoes, particularly undersea volcanoes such as those untracked on the mid-oceanic ridges or the new ones found under the Antarctic ice sheet? Only one thing’s for sure: we’re about to find out, and I blame Putin. He controls everything else, why not the sun and earth? A factoid that is often conveniently overlooked in the Steele dossier: Fusion in 2015 began investigating Trump under a contract with the Washington Free Beacon, a conservative website financially supported by GOP megadonor Paul Singer. That assignment ended once Trump was on track to win the nomination. Not much to disagree with there. Corbyn rarely sees an open goal he doesn’t miss! Can you find the patterns that nobody has been able to do? orbit, (close, far), centripetal force, (more or less), earthquake, volcanoes. Amid slicing and rearranging, we see stern looking face in manner of Renaissance master, then by cascading down pass one rough chiseled and other plump and shiny breast to undefined crotch area and unsuspected turn of the rear end. He never ventured into world of pure abstract but, boy, how many his own “signature style” tables he turned upside down only staying close to the real world as inspiration for experiments. Dr D’s yellow vest video link is disturbing in many ways. Be it medieval peasant revolt or today, it is the goons that stand in between their own class and masters.